Spending a few minutes with the enigmatic Erik Forsberg, it’s clear he’s not someone who turns tail and runs from a challenge. Nothing can deter him from his vision for the new Devil’s Advocate. It seems they went through so many more setbacks than average new restaurants often face. As they were working in the kitchen, a gap was discovered between the wall and the floor, which essentially meant that the floor was in danger of giving way to the basement. They converted the basement into usable space which also holds their impressive amount of kegs. The restaurant space which most recently held the Inn has been given a gentle facelift. There are new floors and, in the front window, a space for seating that will also double as a stage. A stage? In this part of town? “Absolutely,” responds Forsberg. He’s hoping to bring in some Bluegrass/Blues/Acoustic local musicians and continue the tradition of live music that he had started at his last restaurant, the Ugly Mug. It was difficulties with the Ugly Mug space that led him to the new restaurant. After years of struggling to keep that restaurant running close to his vision (including just trying to keep the air conditioning working, which he says the building’s owner refused to fix, leaving his customers sweltering), he decided that it was time to begin anew. The menu is another place where Forsberg felt he needed to fight for his vision. The food is dominated by balls. 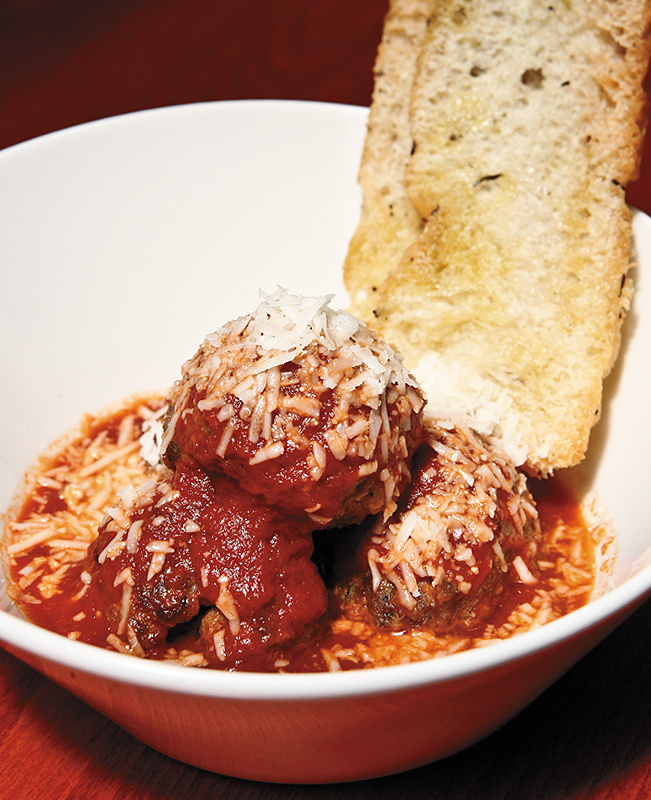 Meatballs with worldly seasonings paired with inspired sides. The original chef couldn’t quite find the groove, but the staff in place now is having some fun—and it’s evident on the plate. The traditional meatballs have a nice amount of salt in them, which makes an eater eagerly reach for one of their beers. In a rich tomato sauce, they taste like someone’s nonna spent hours fussing over them. The falafel is dense, smooth in texture, and served alongside some fregola (a textural sibling to couscous) mixed with fresh mint; it’s a light, refreshing bite. The way Forsberg sees it, the flavor options are endless. On our visit, they were talking about possibly doing a banh mi style meatball. What sounds like a gimmick tastes like a good idea. These small, easy-to-eat bites of food are just begging for a beer. They have over 60 taps and a staff well-educated in their brews. They will be doing many beer dinners, where real aficionados can sip and eat a more refined menu. 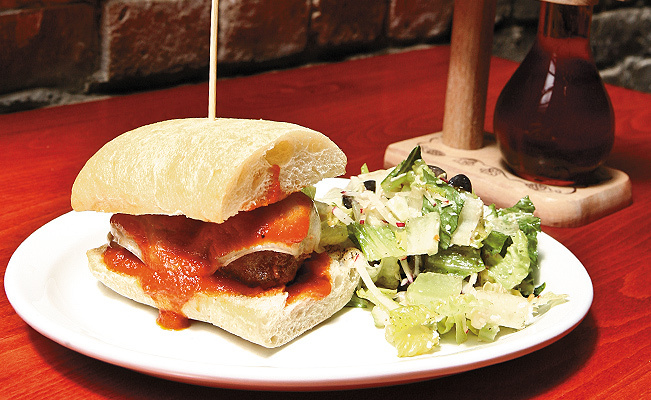 At its heart, the Devil’s Advocate is a neighborhood pub, something this part of town could use. There’s a great happy hour, speedy lunches, and plans for more elaborate dinners. They lead with the beer list, but there’s also a well-selected wine list and plans for craft cocktails. They’re still finding their footing, but as these plans come to fruition, it seems likely to find a comfy spot in the heart of the downtown worker. The Mall of America is a little hipper: Masu Sushi & Robata, the restaurant concept from Sushi Avenue and Tim McKee, opened last weekend. The mega mall is also getting another local darling: Cupcake plans to open their second outpost there. After a failed negotiation for a space on Grand Avenue, and a win on the Food Network’s Cupcake Wars, it’s hard to believe that there’s more fight left in owner Kevin Van Deraa, but he’s moving forward with his sweet shop’s expansion plans. El Burrito Mercado has crossed the river. Their Minneapolis outpost inside Midtown Global Market opens today! 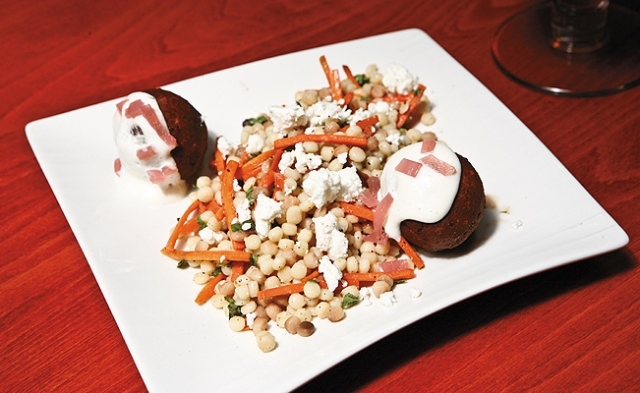 PrimeBar is now open, and early reviews are a bit curmudgeonly. It’s hard to root for another chain landing in Uptown—the onetime hipster hood is now studded with them. The restaurant in the erstwhile Il Gatto space will have sliders, wings, beers and mojitos—nothing new, but a much needed facelift with a wide open view of the front windows and a middle of the road menu may very well serve a wide swath of shoppers. Only time will tell. The beer list here is one of the best and most diverse in town- and the bartenders knowledgeable and happy to offer tastes. Glad to hear music is on the agenda. I am really looking forward to cozying up here after work in the cooler months.